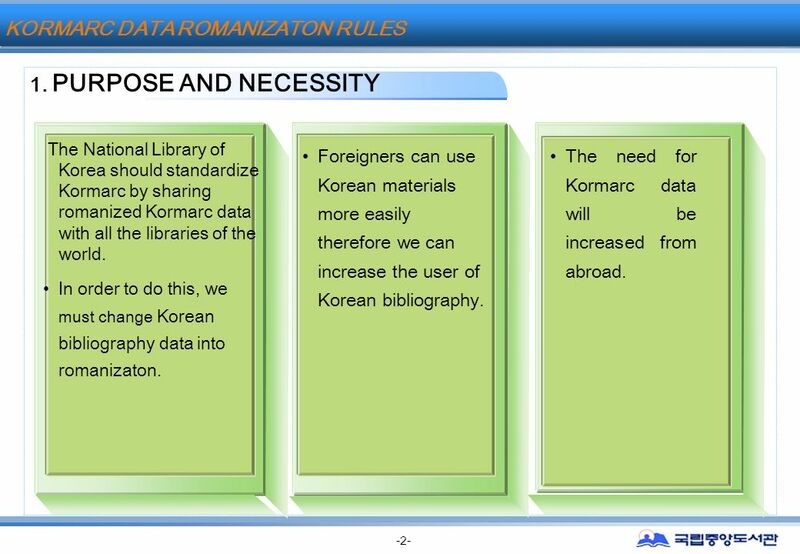 2000 ~2002 KORMARC KORMARC -0- ROMANIZATION OF KORMARC DATA - For the International Korean Bibliography – The National Library of Korea. 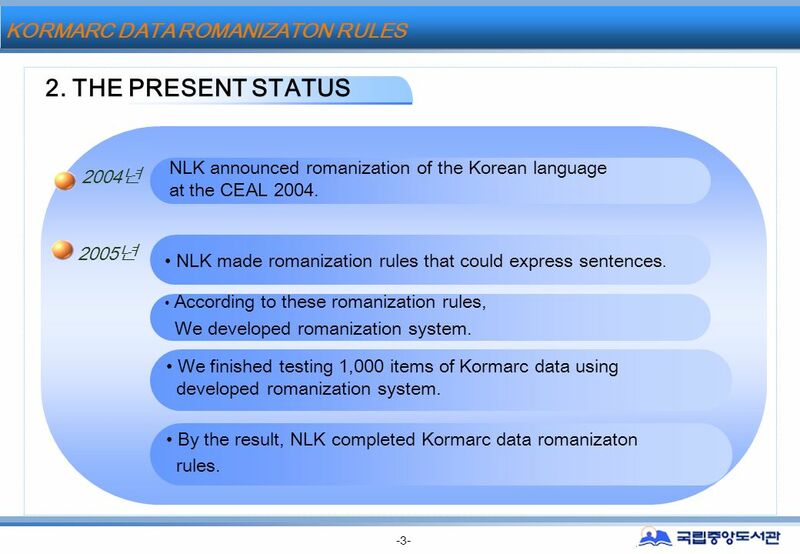 6 2000 ~2002 KORMARC KORMARC -5- 1) Spacing words. 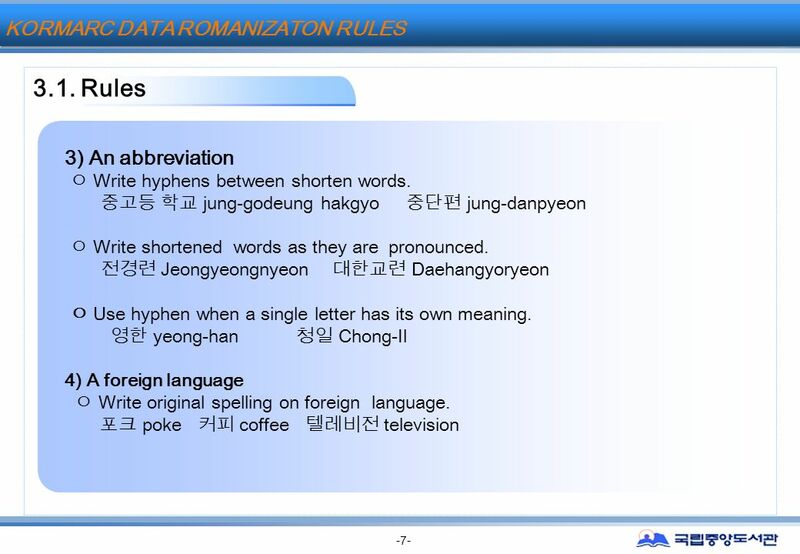 spacing a word not by a unit. 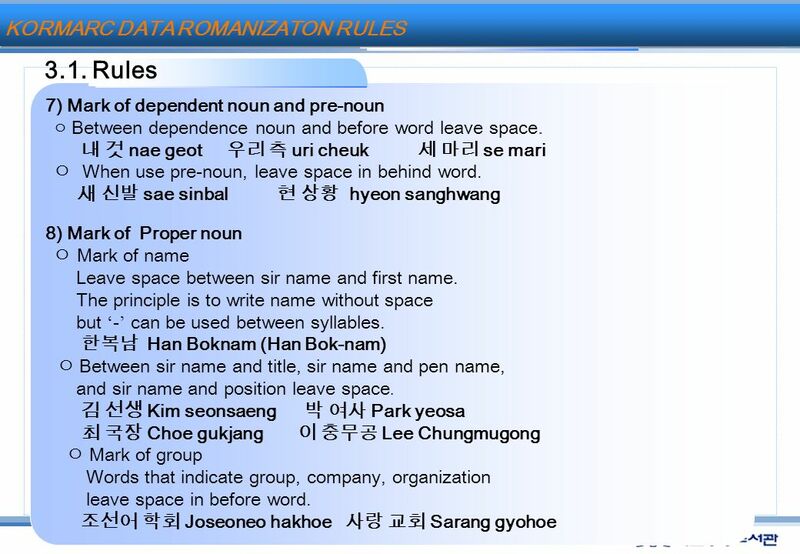 Hanguk geundae munhak Bulguksa samcheung seoktap 3.1 Rules KORMARC DATA ROMANIZATON RULES NLK announced romanization words last year. 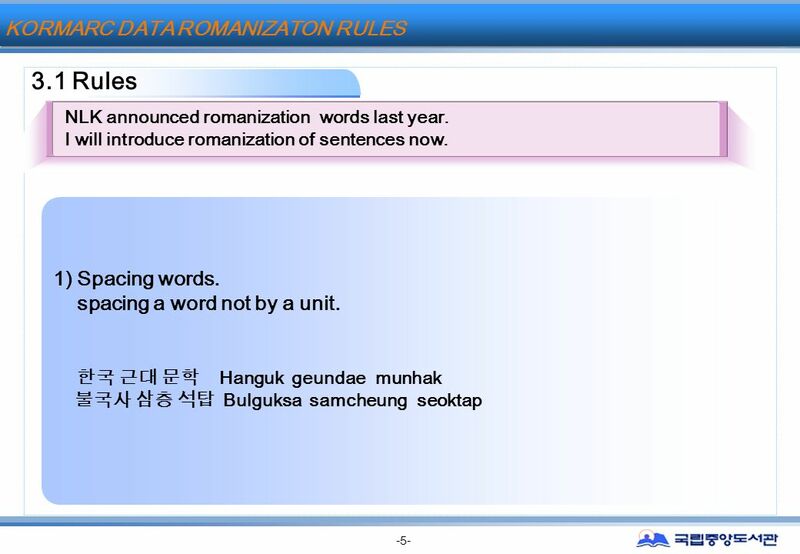 I will introduce romanization of sentences now. 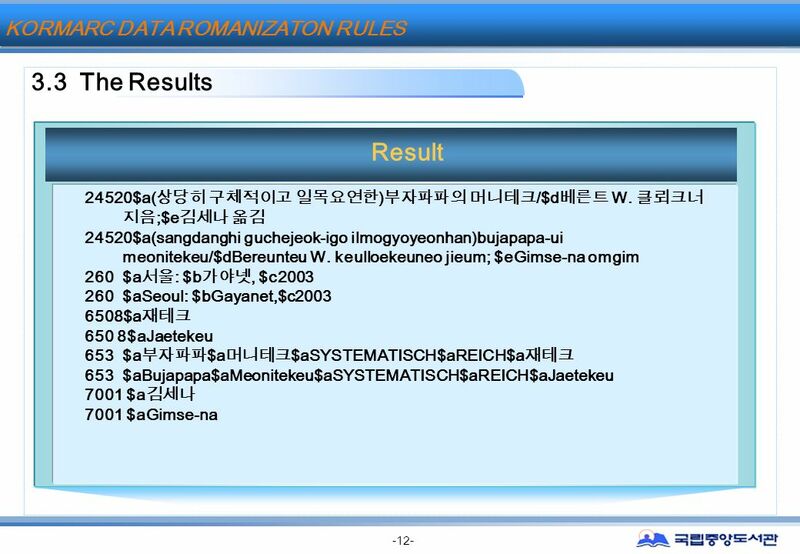 14 2000 ~2002 KORMARC KORMARC -13- 24520$a( ) /$d W. ;$e 24520$a(sangdanghi guchejeok-igo ilmogyoyeonhan)bujapapa-ui meonitekeu/$dBereunteu W. keulloekeuneo jieum; $eGimse-na omgim 260 $a : $b, $c2003 260 $aSeoul: $bGayanet,$c2003 650 8$a [E--] 650 8$aJaetekeu[jae--] 653 $a $a $aSYSTEMATISCH$aREICH$a 653 $aBujapapa$aMeonitekeu$aSYSTEMATISCH$aREICH$aJaetekeu 7001 $a 7001 $aGimse-na 3.4 KORMARC DATA ROMANIZATON RULES Kormarc romanizaion ruleserrorcorrect Standard Korean pronunciation ilmogyoyeonhanilmognyoyeonhan Foreign language Bereunteu W. Keulloekeuneo meonitekeu papa Bernd W. Klockner moneytech NameGimse-na Gim Sena (Kim Sena) 3.4 Analysis of the results. 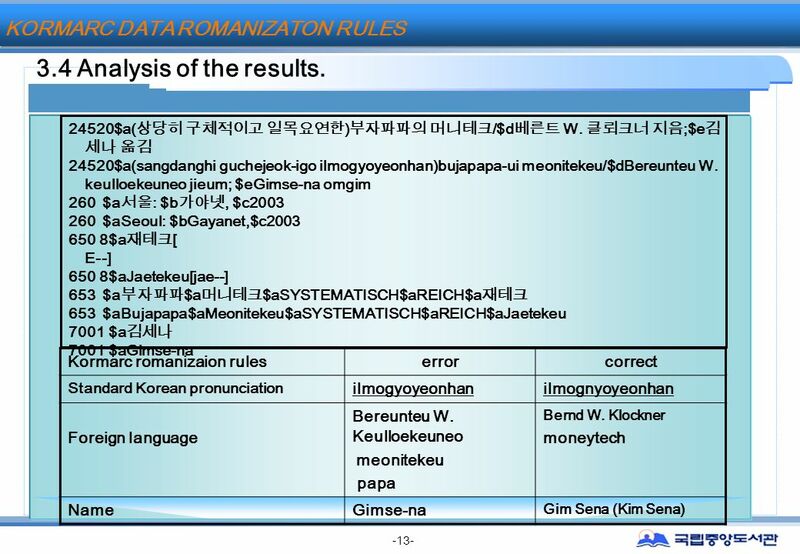 Download ppt "2000 ~2002 KORMARC KORMARC -0- ROMANIZATION OF KORMARC DATA - For the International Korean Bibliography – The National Library of Korea." 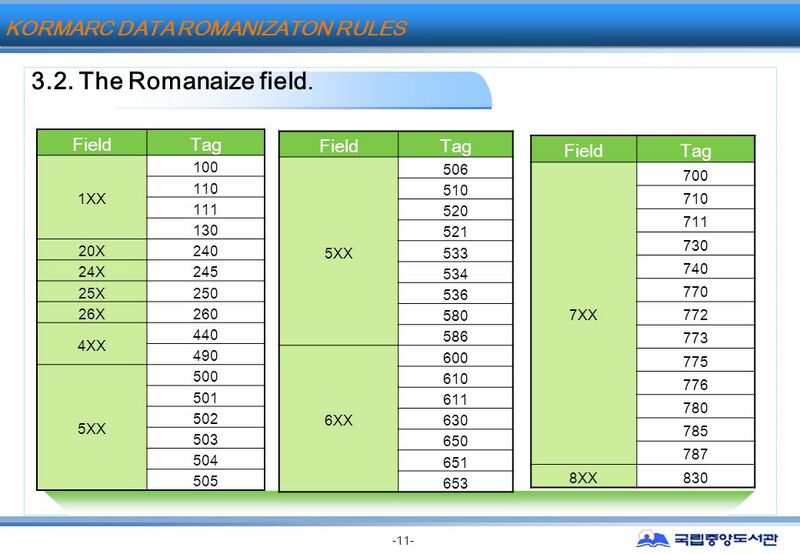 Win Big AddingSubtractEven/Odd Rounding Patterns Q $100 Q $200 Q $300 Q $400 Q $500 Q $100 Q $200 Q $300 Q $400 Q $500 Last Chance. 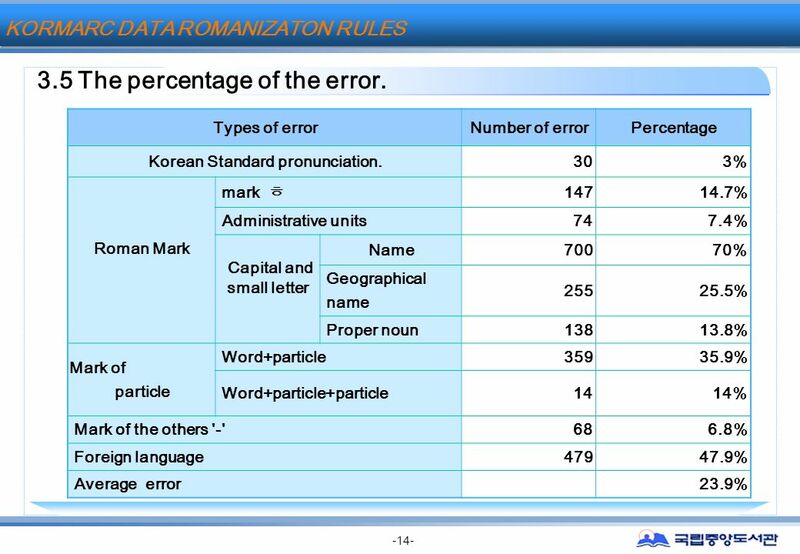 OECDs approach to publishing datasets ALCTS: Webinar: Datasets for Publication, Standards and issues 7 December 2011 Terri Mitton Data Products Project. 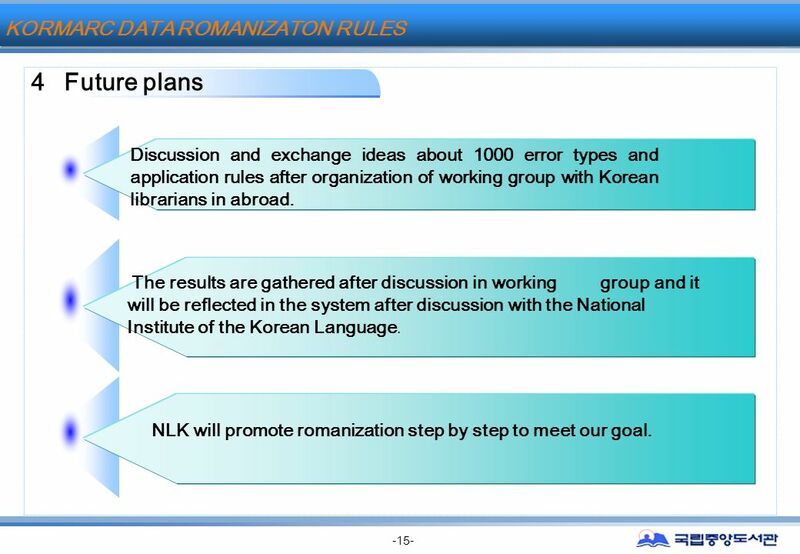 Korean collections RECON project in NII/NACSIS-CAT network March at CEAL CKM Meeting. 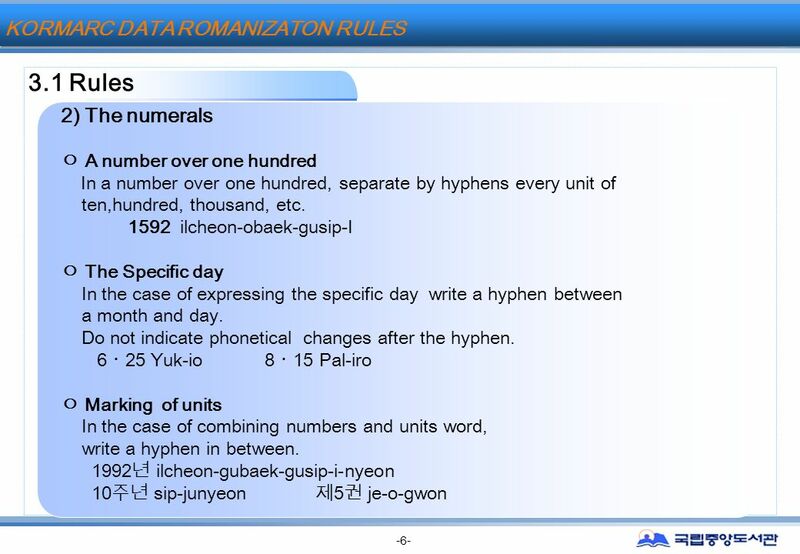 Korean Romanization Revision Project By Yunah Sung April 6, 2006 Committee on Korean Materials CEAL. 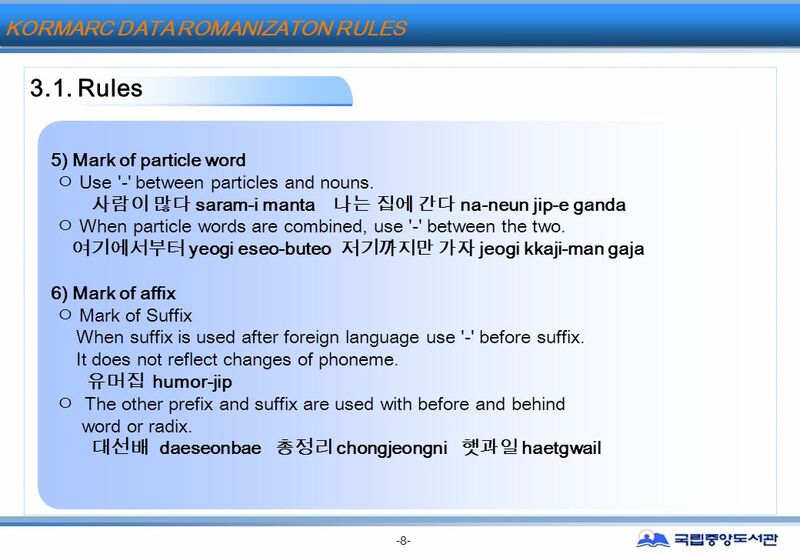 Support program for SME IP activity in Japan Naohiko YOKOSHIMA WIPO forum on intellectual property and small and medium-sized enterprises 13 September.